ATM Sales and Methods of Payment. Shopping for an ATM. Other payment methods are accepted, please contact us to inquire. We also utilize a lease company for those businesses that would rather lease to own than purchase. Keep in mind when purchasing an ATM, you will need money to fill it. Some businesses prefer to lease an ATM which frees up enough cash for the initial filling of the vault. Machines run from $2295 and up, and the vault cash required to stock the machine can be $2000, $5000, sometimes $10,000 depending on how often the machine is used. Of course the money used as vault cash comes back to you in your bank account in 48 hours. Leasing an ATM spreads out your payments over time, easing the burden of having to come up with $2000 to put into the machine to start out. 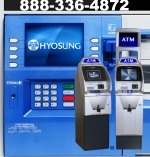 ATM leases are also tax deductible in most cases. Automated Teller Machines purchased or leased from us include a processing agreement from MAG that needs to be signed and returned. We can furnish you our FedEx Services if you need them. When you order your ATM from us, we will fill out an invoice with all the details of the purchase and FedEx it to you for your approval. Other forms will need to be filled out that include the terminal ID number and your bank account information. This is needed so your surcharge money and vault cash can be direct deposited into your business checking account by ACH. The whole process of buying an ATM is much easier than it seems. We do the work for you!